Please ensure that you complete the Registration form/s for all members of your party have been received one month prior to course. As a general rule we ask you to arrive in Salcombe in time to catch a launch out to Island Spirit at 1700 hrs from Batson Creek slipway, known as Town Slip (post code TQ8 8NJ). Our launch will take you out to where ‘Island Spirit’ is moored. Any wet weather clothing that you have pre ordered will be available onboard ‘Island Spirit’. 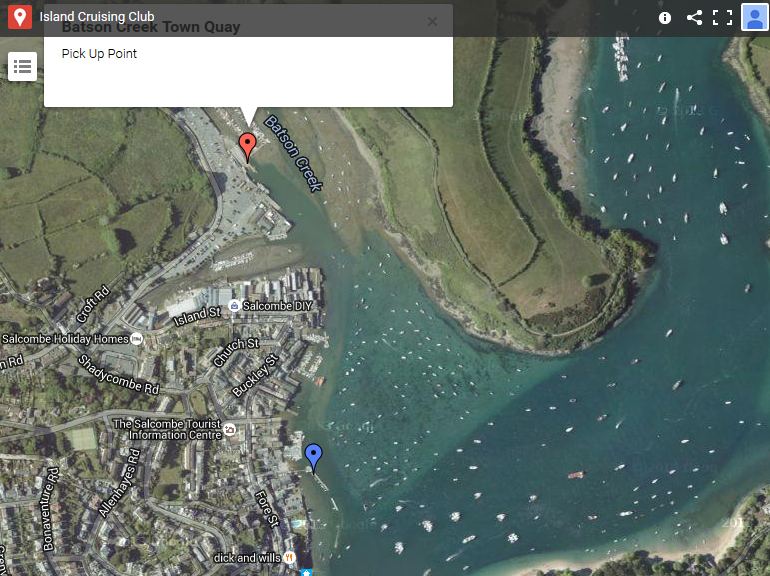 On arrival you will have a safety briefing and passage planning session with your skipper followed by a light supper. You will normally arrive in Salcombe sometime during the afternoon and be on shore by 15.30 at Normandy pontoon(centre of Salcombe) or Town Slip,Batson. We recommend that you park your car in The Creek car park in Gould Rd – this is ideally situated for catching the launch from the Town Quay/Slip pontoon ( TQ8 8NJ). If you are sailing for the weekend you will need to buy tickets to cover the time you will be parked (i.e. one for each day) and display these clearly on your windscreen together with a note that says you are sailing on the yacht with the ICC. Available either collected by you personally or through the post from Salcombe Tourist information Market St TQ8 8DE tel 01548 843927 Note: space is not guaranteed. Please ensure that you bring all necessary medication with you. Our Lifejackets must be worn at all times whilst on board the yacht (including tender)and all club boats unless directed otherwise. Holiday cancellation and travel insurance is NOT included in the cost of your course/sailing. Personal effects are only covered to the value of £199.We strongly advise that you take out your own holiday & travel insurance. Please bring your RYA Logbook with you. In addition, for those taking Yachtmaster Coastal or Yachtmaster Offshore examinations, please bring your Restricted (VHFonly) Radio Operators certificate or Short Range certificate, First Aid certificate & a recent passport photo. You will need to pay the examiner direct when he /she boards the yacht. The RYA publish excellent books for their courses. These provide a sound basis for what you will be taught on the course. The books are on board ‘Island Spirit’ but some clients have found it beneficial to study them prior to the course. You will be given a full safety briefing by your skipper soon after arrival. The briefing will cover all aspects of safety and the use of facilities on board. A safety harness and lifejacket is provided for each crew member but if you prefer to bring your own then it must be auto-inflating and in date. The yacht has a current MCA safety certificate. Sailing can be relatively strenuous. It is essential that you advise us of any medical conditions such as physical disability, asthma, epilepsy, diabetes, heart/lung conditions. We must also be advised of any medication you are taking. All such information will be treated with the strictest confidence and your yacht skipper will be made aware for your safety. Your meals will be taken on board the yacht and the cost of food for these is included in the price of your course. Sometimes if the yacht is in port the crew may decide to eat ashore – if this happens crew members are responsible for the cost of their own food and there is no offset allowed for meals not taken on board. On the first evening on board there is no cooked meal as such but a light supper in the form of pasties or similar is provided. Passport – if going across the channel- this is essential as we are unable to refund any money should a booking have to be cancelled as a result of failure to bring your passport or the appropriate visa. Evidence of EU health insurance is also advised. RYA courses do not go out of UK waters unless advised prior to leaving. Please note: sailing waterproofs are available for hire from the ICC. Remember it is colder at sea than on land and it can be very cold on night watch even in high summer. Non slip shoes and Wellington type sea boots (not black soled) are essential. Protection from the sun is essential. The sun is very strong at sea and can attack from both the sky and reflection from the water. If you think you may suffer from seasickness it is worth visiting your chemist for advice as there are a range of specialist products available. These should include soap and towels. A small torch is useful though there are emergency torches on board. Please note: Alcohol is not provided and may only be consumed on board at the discretion of the skipper, but normally there is no objection if you wish to bring a small amount of beer or wine to accompany your dinner! If your course or cruise is specified to cross the channel, you may wish to bring some euros if travelling to France though sterling notes can be changed in most ports. We suggest you pack luggage in soft bags as stowage space is limited on the yacht. It is essential that you complete and submit your Registration Form before arrival. Please ensure that your relatives have our emergency contact details – these are as follows. Course certificates for Day Skipper and Coastal Skipper need a pasport type photo so that the club can issiue it to student.